New Re-hesive™ technology allows removal and reapplication without damaging the label or the envelope. Won't fall off - guaranteed! 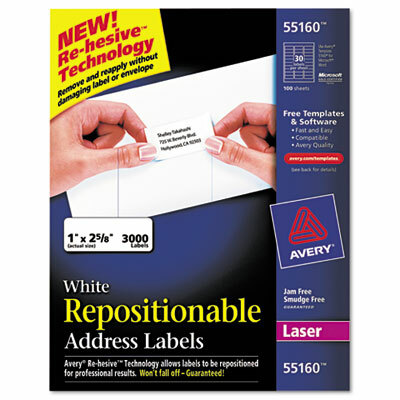 Exclusive new Re-hesive™ technology allows labels to be removed and reapplied without damaging the label or the envelope. Won't fall off -- guaranteed! Also guaranteed to be jam- and smudge-free. Avery® offers so many free, easy-to-use design and print solutions for labels. See product package for details.